Sit back, breathe in the energy around you, close your eyes, and join your fellow travellers on a journey that will take you far, far away. No, you’re not at Circular Quay, the gateway to a thousand destinations that sits on the edge of Sydney Harbour’s glistening waters? You’re in an audience that’s heading to exotic places in time, space and imagination, led by Circular Keys Chorus. Circular Keys Chorus is a women’s barbershop harmony ensemble of over 50 women. Our members come from the greater Sydney region, in particular the north-western suburbs and Central Coast. 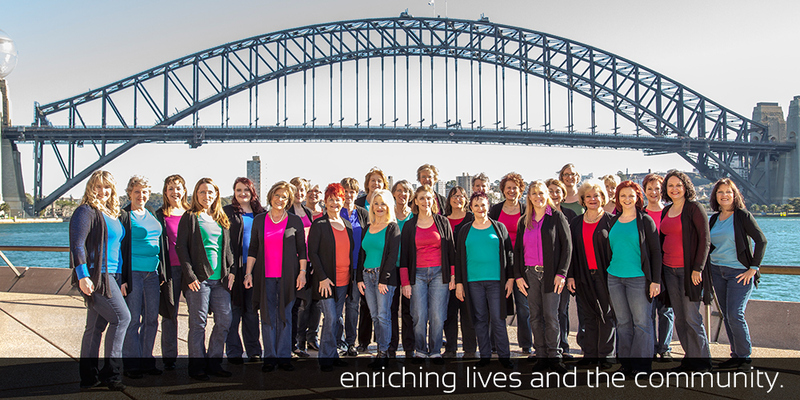 Since 1995, we have been performing concerts and delighting audiences throughout Australia. We also compete regularly in barbershop harmony competitions and have won many awards over the years. Our achievements have taken us to the USA three times to represent Australia in Sweet Adelines International Conventions. Circular Keys Chorus is a chapter of Sweet Adelines International, one of the largest singing organisations for women in the world. Our members come from diverse backgrounds and experiences, but we all share a love for barbershop music and a desire to enhance this art form through regular practice and performance. Above all, we embrace the Sweet Adelines' motto of ‘real women, real harmony, real fun’ whenever we rehearse or perform. Our reward is the friendships we form and the personal fulfilment that comes with the ongoing pursuit of musical excellence. Circular Keys Chorus is a not-for-profit incorporated association. We welcome new members who share our passion for creating harmony and performing for others.